Being a respectful parent, I’m sometimes told what I do isn’t good parenting. ‘Good parents’ punish their kids, they control them and this apparently makes children into good adults. I feel as though almost all parents hope to help their kids grow into adults that know how to make smart choices and have emotional intelligence. I don’t feel like treating children like second class citizens is the way about this. I think the biggest step is viewing kids as people. In general, adults hold entirely different standards for children. Often kids aren’t respected and they are held to high expectations. There’s a general consensus with some people that children are possessions and wouldn’t function without strict rules, rewards and punishments. Yet I know now-adults and teens who as children were treated with respect and are functioning members of society who seem to have it together much more than many of us who were traditionally raised. Kids are forced to obey without question and even shamed when they don’t. The truth is I don’t want to be viewed as a ‘good parent’ by a society that thinks so little of children. Would I talk about my husband as if he wasn’t right there? Would I tell a friend to hurry up? Would I expect an adult to finish food they don’t like? We wouldn’t force an adult to share or apologise or calm their reaction, would we? I sure wouldn’t! I think we would recognise that they’re having difficulty and that this was a hard moment. We wouldn’t find it normal or justified to turn our backs on the distress of any another human being; so why a child? Why is it okay to make fun of children? Why is it okay for people to say they think kids deserve a smack (violence)? Hitting people is wrong. Kids are people too. Shaming people is mean. Kids are people too. Children deserve respect. They deserve to be have a say. Children deserve to be heard. They deserve to not live in fear of punishment. Kids deserve to be seen and treated as having a separate existence and not simply as extensions of their parents. They deserve freedom within limits. Ultimately, kids deserve to be seen as people too. I expect the judgement. I expect the eye rolls when I get down on my children’s level and talk with them about their choices. How dare I involve them in decisions that affect them and treat them respectfully!? I am used to the outrage when I admit we don’t punish our kids. Yes, we don’t punish our kids (here’s what we do instead) You read correctly. I don’t hit them, send them to time out, humiliate them or take away their possessions. The horror! According to general western society I’m raising self-centered out-of-control brats! Yet, we’re consistently told our children are lovely and they blow us away with their respectful nature. If you want children to respect others – you must respect them! If you want children to listen – you must listen to them! 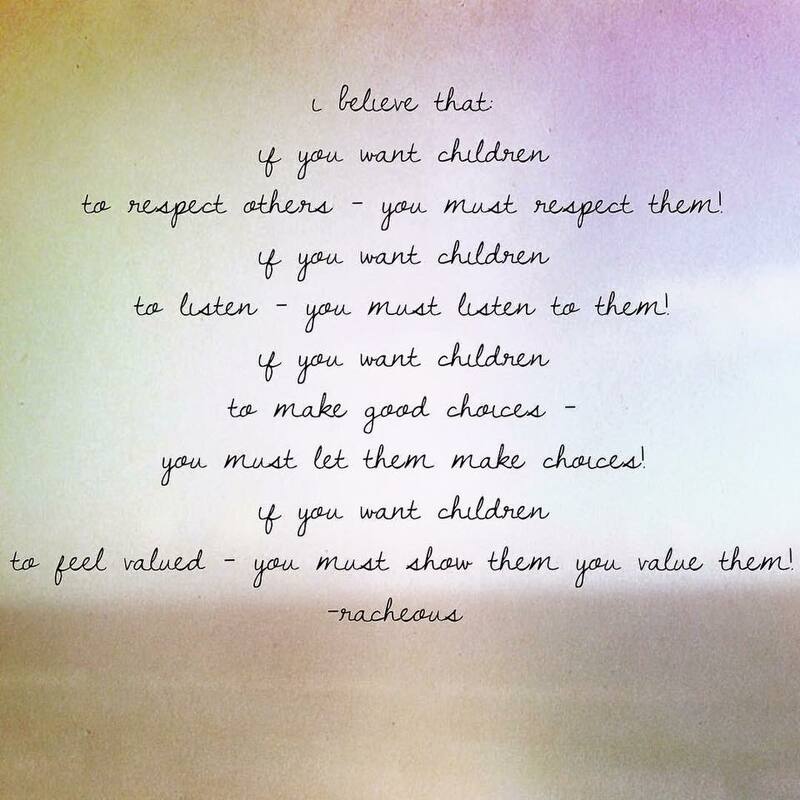 If you want children to make good choices – you must let them make choices! If you want children to feel valued – you must show them you value them! It’s pretty obvious – if you give them a voice, freedom and love then they feel valued and free and loved. I want my kids to know that I respect their autonomy. I want my kids to know that their feelings matter. I want them to know that their opinion is just as valid as mine. I want them to feel respected and heard and safe. 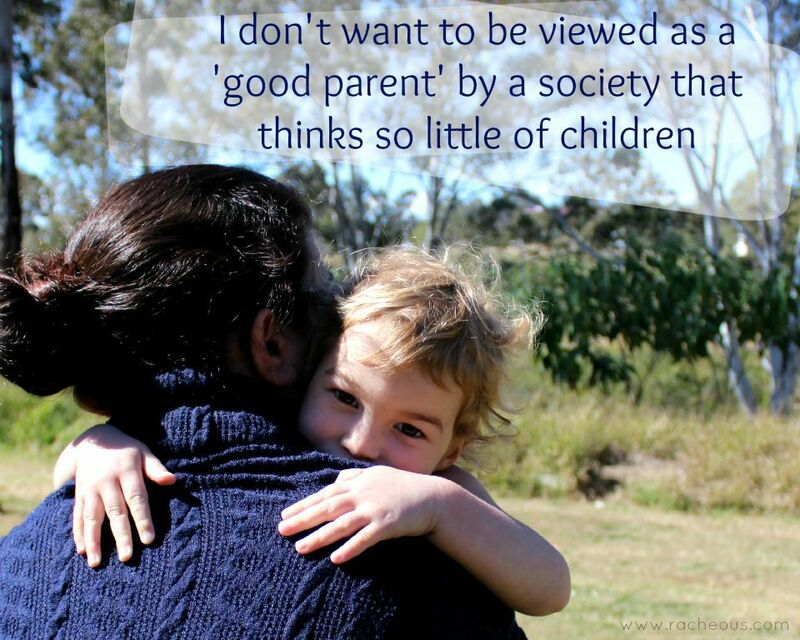 So yes, I don’t want to be viewed as a ‘good parent’ by a society that thinks so little of children. Hi Racheous. Thanks as usual for a great post. I have many of the same ideals as you for parenting and I try to be kind and respectful to my 2 children. However, in fact one of them can be rude, loud, ignoring us etc etc.This is causing us a lot of stress and I am worried I need to turn to more traditional methods which I do not want to do. This behaviour has been going on for over a year. What would you advise please? How would you help your child to behave betterwhen he is shouting at you, ignoring polite requests and being rude to others? (aged 5). Please help! So how do you do it then? How do handle sibling arguments or hitting? How do they learn the consequences of bad choices? My children get choices, have limits and have freedom. I was raised in the ‘children should be seen and not heard’ Era so I especially agree and try to listen and respect them as individuals but they are still young and inexperienced and impulsive and….children. Three boys play together but they also fight very well together. They work with me but also get mob mentality forget to do what needs to be done and play. What happens then? I hear this a lot and I think it’s hard to envision when you haven’t lived it or experienced it before. I think I should write a separate post with what we DO do. I will work on that and link it here. I am totally signed up to this way of thinking now and learning what it looks.like in our family. But I am suddenly running into issues with friends who are lovely people and important to me and my children. How to deal with differences in parenting without them always taking offence? My way is my own choice but I will stand up for my children in the face of others disrespect. I see it everywhere but don’t want to lose these friends.